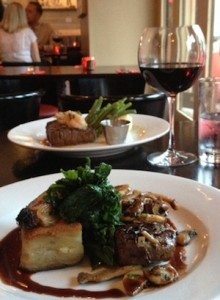 After a long and busy week, my partner and I wanted to go somewhere for dinner where we could enjoy a good steak and relax. It was a Friday night and the streets of Brighton were buzzing. We decided to park in Trafalgar Street and meander down seeing what took our fancy. I’ve always loved Trafalgar street for the atmosphere, but to be honest all the times I’ve walked down there have usually just been as a gateway to the North Laines. Apart from a random coffee after a job interview one time I’ve never stopped and sampled any of the eateries or watering holes. 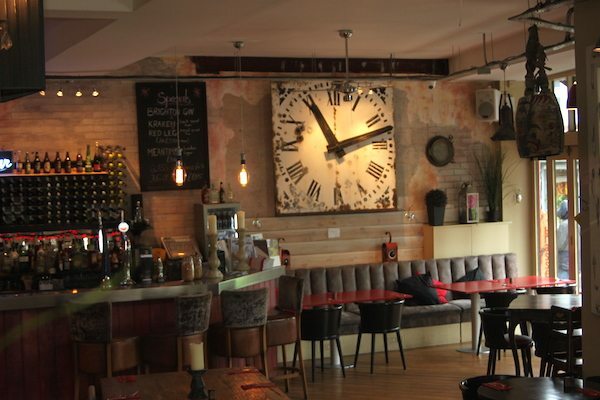 Then we came across Breeze Brasserie. Towards the bottom end of Trafalgar Street, opposite Pelham Square, award winning Breeze Brasserie really lives up to its name as it does look ‘bright and breezy’ even just from the outside. There’s something about it that says ‘Come in, join us’. The exterior is a bright post-box red, my favourite colour, with a canopy reaching out to cover guest’s dining alfresco. There are floor to ceiling glass shutter doors which are open. There are people sitting outside on the pavement with lattes, cocktails and light snacks such as marinated olives and bruschetta. Everyone is sitting far back in their chairs looking extremely relaxed. We wanted some of that. As we walked in, we could instantly feel the lively and buzzing atmosphere. But unlike some busy restaurants this did not feel chaotic, but in fact laidback. middle of the main floor, and there were more guests seated on the slightly raised second level. We were greeted almost straight away by Bruce the owner. He gave us a huge warm smile, as if we were old friends. After a minute of talking to him, we felt like we had known him for years. Before I started to look at the menu, my eyes started roaming the walls. The style at Breeze was very unique and quirky with a taste of the Middle East. 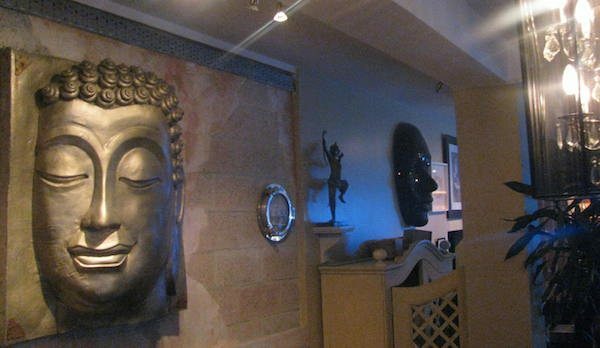 There were many interesting things to look at including a brass look 3D portrait of a Buddha. Perhaps this Buddhism influence was what contributed to the atmosphere feeling so relaxed and laidback. Inspired by Modern European cuisine, the very affordable menu is a great selection of simple tasty pasta dishes, risottos, burgers, seafood and grills. As well as lots of enticing mains to choose from there’s also a great list of starters and light meals for those who just want a light and lazy snack. This is something I noticed about Breeze, that the customers there on that Friday night were all there for different reasons and were all being catered for. People like us for a 3 course meal, Laine shoppers or workers with just a coffee and a dessert or a cheeky drink and a snack, and large parties who were in for the long haul. Though there were many tempting things on the menu, for us this choice was easy as we both had our heart set on a nice juicy steak. There were two steaks to choose from which was great as we ordered one of each and vowed to share. 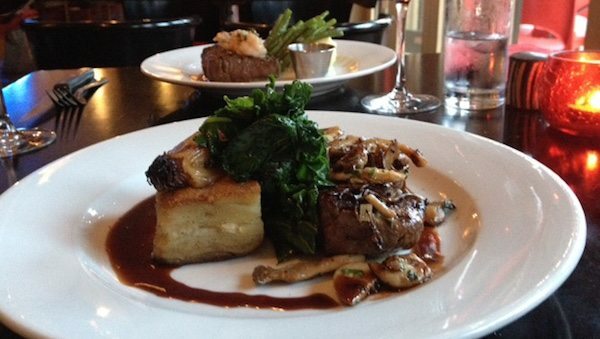 The ‘Chargrilled Beef Fillet’ came with sautéed wild mushrooms, kale, pommes anna, roasted shallots and red wine jus. It sounded heavenly. 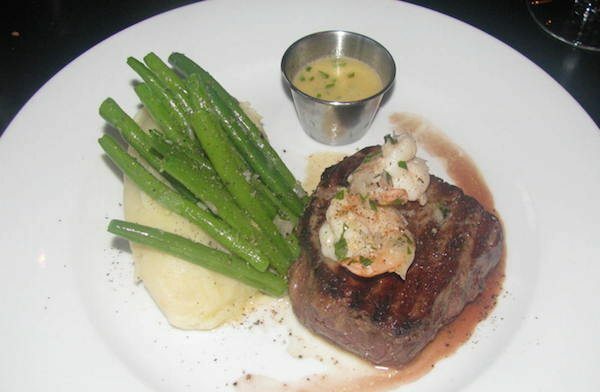 The signature ‘Breeze Beef Fillet’ came topped with king prawns, garlic butter, French beans and a creamy cabbage mash. The meat is locally sourced from Rogman butchers in Hove. 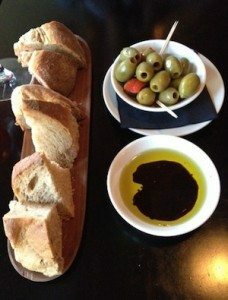 To save our appetites, we decided to keep things simple and have some fresh bread and marinated olives to start. This was a great choice. The bread was warm, rustic and incredibly fresh. It literally tasted like it had come straight from the oven. The olives were ginormous and absolutely superb. I love olives but sometimes they can be too ripe and mushy and have a slightly perfumy taste. These were ripe but firm and juicy. They tasted lovely and herby with a touch of chilli. We ordered a glass of red each to go with our steaks: Tommy the house and the Pinotage for me. Both were great wines: deep, smooth and slightly smoky. Delicious. Our long, hard week was starting to drift away. Putting a knife through butter.. When our steaks arrived, I almost jumped with joy. They both smelt incredible and looked beautiful. Presented carefully but simply, the food itself spoke volumes. When we cut into our fillets we both commented how easy this was like putting a knife through butter. They were cooked spot on to our liking. The quality of the meat was absolutely superb. We both honestly could not remember a steak we had experienced which tasted better. The accompaniments for each complimented the flavours of the steak perfectly. Not too fancy or over complicated that you couldn’t taste the unrivalled flavours that a good steak brings. juices creating a gorgeous sauce. With the rich and sweet red wine jus, the end result was fabulous. With my ‘Breeze fillet’, the garlic parsley butter drizzled over the plump king prawns mingled with the steaks juices also creating a mouth-watering ‘jus’ which I could have mopped up with bread. In fact, if I’d have been at home I would have picked up my plate and drank it. Thankfully, the creamy cabbage mash soaked up a lot of this which was delightful. We barely spoke throughout our meal. A meal this pleasurable deserved to have our full attention. Extremely satisfied and relaxed, all thoughts of work forgotten, we contemplated the dessert menu. We were pretty full at this point but didn’t want the meal to end. We settled on sharing a dessert and vowed to come back another time to try more. I already had plans for a cheeky after work pit-stop for a cocktail and a dessert. The warm chocolate fondant with vanilla ice-cream beckoned us. It took a little while to come out as ‘proper’ fondants do which gave us time for our steaks to settle and to sit back and admire our surroundings. When it arrived the waiter smiled telling us that we had made a good choice. Served on a simple white round plate the fondant was in the centre, dusted with icing sugar and encircled by a swirl of raspberry coulis. It was gorgeous. Soft, warm and gooey. A beautiful end to a beautiful meal. Breeze Brasserie was a big surprise to me. For no reason in particular just that it seemed to have escaped my notice. 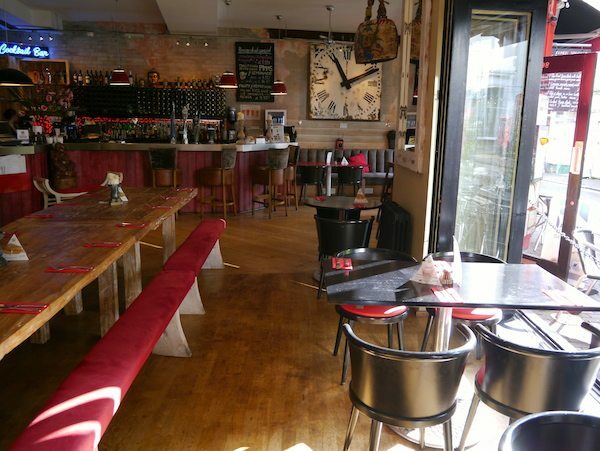 It is now well and truly on my radar however and I’m looking forward to my next visit to this bright and breezy, bustling brasserie.